Our aim is to provide clear and transparent information regarding our financial position, fees, investment philosophy, and performance. Additional information is available through Brian Hamilton, our Chief Financial Officer. Read our 2017 audited financial statements here. Read our 2016 audited financial statements here. Legacy Deo accepts gifts of publicly-traded securities (i.e., stocks, bonds, mutual funds, ETFs, etc.). These gifts can fund new accounts, augment existing accounts, or be contributed to Legacy Deo itself. We also liquidate securities and pass the sale proceeds to another ministry or charity of the donor’s choosing. One-time gifts are charged $25 to receive, sell, and distribute the net proceeds. 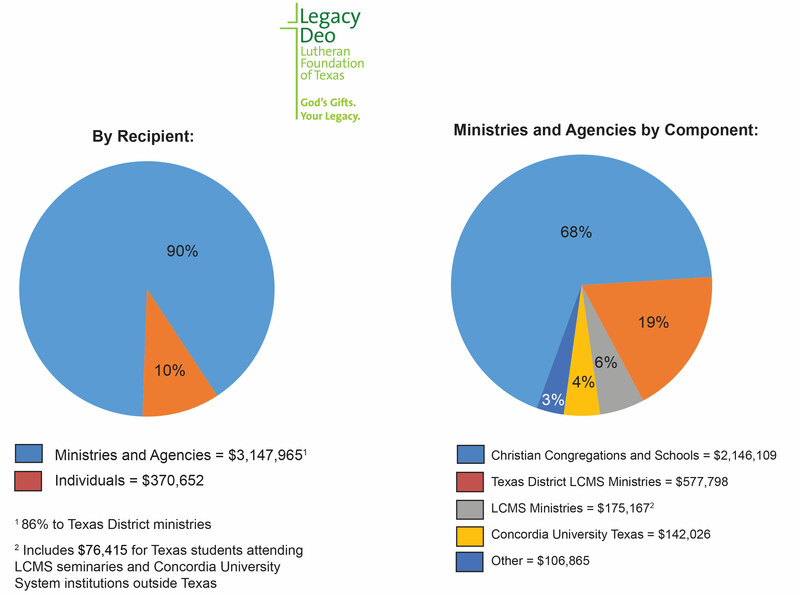 This amount includes up to three distributions to external ministries or charities. An additional fee of $10 per distribution is charged when the number exceeds three. Statutory fees charged by securities brokers are netted against the proceeds prior to distribution. For recurring gifts, we require a pass-through trust account to be opened. A one-time fee of $50 is charged to open the account, which also covers processing the first gift transaction. Subsequent gifts incur fees at the same rate as one-time gifts. A minimum balance of $250 is required to maintain an active pass-through trust. Upon closure of the account, this minimum balance is passed through to the final ministry or charity. Legacy Deo can serve as administrator of an estate. Fees charged will fall within the maximum allowed by the Texas Probate Code. Related travel and administrative expenses are charged at actual cost. Fees are netted against the estate’s value. Gifted real estate, when subsequently sold, incurs a charge equal to 5% of the property’s sales price. When a realtor is involved, the fee is reduced to 2%. This fee is netted against the proceeds, which typically includes other charges required to complete the sale. Most trusts require preparation of an annual tax return. Our base fee is $80, which includes preparation of taxpayer forms such as K-1 and 1099. Complex returns requiring additional preparation time are charged a minimum of $120. When establishing a new account, Legacy Deo absorbs the first $200 of legal fees. Excess amounts are charged to the account. Fees for legal matters arising after inception are charged to the account. Read our investment policy statement here. Legacy Deo is pleased to offer our clients five investment funds having distinct return objectives. Two cover the full spectrum of fixed income securities, two address different equity strategies, and one provides non-correlated assets as an alternative to traditional investments. Each fund is professionally managed by one or more firms in concert with our investment consultant, Graystone Consulting – a business of Morgan Stanley. Assets are held through our Morgan Stanley brokerage relationship. Equity ETFs Bahl & Gaynor, Inc.
Allocation to these funds is dependent upon the objective of the underlying account, its distribution time horizon, and input from the accountholder. By varying the degree of allocation to the underlying funds, we are able to create portfolios that range anywhere from conservative to aggressive. Our investment philosophy is different than that of the typical individual investor, who tends to focus mainly on accumulation. Because Legacy Deo is in a perpetual phase of distribution, our orientation is toward long-term capital preservation and reasonable risk-reward tradeoffs.